This recipe for Russian rye bread is easy because it requires no sourdough starter. But that means it won't have the tang you may have come to know and love about ryes. The recipe has its merits, though, and is great for those watching their fat intake because eggs and oil are not in the ingredient list. It's moist but very dense because all rye flour is used. 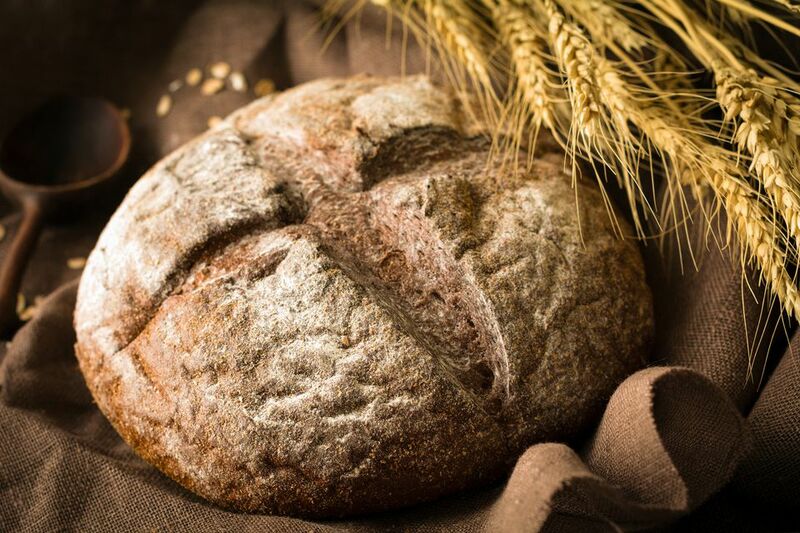 (Typically, rye breads have a certain quantity of whole-wheat or all-purpose flour to lighten them.) The extra yeast in this recipe, however, keeps it from becoming like a lead balloon. To lighten the loaf and give it a crunchier texture, all-purpose flour and rye meal can replace some of the dark rye flour as indicated below. Note: For a lighter loaf, use 3 to 4 cups dark rye flour, 1/2 cup dark rye meal and 1 cup all-purpose flour. If you are uncertain about your yeast, proof it before starting. In a large warmed bowl or the warmed bowl of a stand mixer, dissolve yeast in water. Stir in corn syrup and set aside for 5 minutes or until yeast foams. Add 2 1/2 cups dark rye flour and beat with a spoon until smooth. Stir in salt. Cover and let rise about 30 minutes. Add 2 more cups flour, gradually, mixing after each addition. When dough becomes difficult to stir, knead by hand or by machine, adding up to 1 cup additional flour, if needed, until dough is stiff but slightly sticky. Form dough into a ball and place in a clean, dry, warmed bowl (do not coat with cooking spray). Cover and let rise until almost doubled, about 2 1/2 to 3 hours. Punch down dough and, with floured hands, form into a loaf. Place in a 9-inch-by-5-inch loaf pan that has been coated with cooking spray. Cover tightly with plastic wrap and let rise for 1 hour (it probably won't rise above the pan). Heat oven to 350F. Bake 30-35 minutes or longer or until an instant-read thermometer registers 190 degrees. If you've used all rye flour, the top won't brown much, so don't measure doneness by that. Turn out onto a wire rack to cool completely.